Si Yi (See Yep) is the name of 4 counties situated on the Southwest of Guangdong (Kwantung) Province of China, namely: Taishan (Toi Shan), Kaiping (Hoi Ping), Enping (Yan Ping) and Xinhui (Sun Wui). People from these four counties have slightly different but distinctive dialects, and yet they share very similar customs; hence they have always been treated as one region. Although people in this region were energetic and dilligent, there was not enough land for cultivation for everyone. When China allowed foreign trade to come through Guongdong province, Si Yi people saw the opportunity to find work overseas. The first wave of migrant workers went by boat to South East Asia, countries like Borneo. Sometime later, American countries recruited Chinese labourers to work in their continent. Since then, Chinese emigrated to many countries around the world. At the end of the 18th century, the first Chinese to arrive in England was Mr. Yue Chun of Taishan (Toi Shan) County. He came to London and worked hard for a shipping company for a considerable period, until he had saved enough money to start a laundry in Liverpool where he eventually retired. During his time in Liverpool he was very diligent and also had a love for his own people. 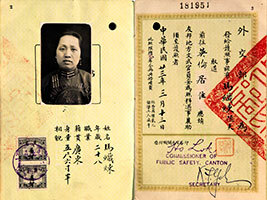 After 1900, more Chinese people from Si Yi came to England to look for work. As the number grew, they realised to suceed, they had to unite in order to achieve more for themselves. So they formed an organisation called See Yep Chinese Association with Yue Chun who led the executive members. They set out the principles and the objectives of the association and in 1906 they bought the premises of 69 Pitt Street, Liverpool 1 as their first headquarters. In September of the same year they elected the first chairman of the association, Mr. Wong Kau, followed by two more chairmen before the outbreak of Second World War. As there were more countrymen looking for work than the Chinese laundries could provide, the association found it necessary they should come to their assistance. Hence, in 1915, they introduced and operated a scheme with all the members of the association donate money into a central fund to help the needy members to buy their own individual laundries. Since that date, more laundries have been established throughout England and our fellow countrymen were fully employed. When the Second World War started, our countrymen knew that the Japanese were fighting on our homeland. 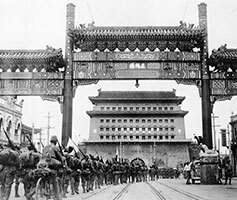 To show their love for our own country, our countrymen purchased war bonds to assist the defence of China against the Japanese aggressors. 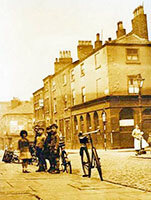 Liverpool is a commercial harbour city where most of our countrymen liked to live and work. Unfortunately, Liverpool was bombed and badly damaged during WWII, and during this time the association was unable to function properly. 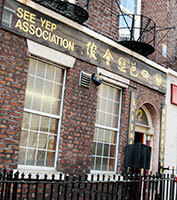 After the war, Mr. Chan Kworn Charn and others, in spite of the fact that there were grave difficulties, started to re-organise the association, and in 1954 they re-established the See Yep Chinese Association at 22 Nelson Street, Liverpool 1. The property was originally owned by Chan Kong Churn, Leung Dun and Ng Kin Yee. The three eventually donated the property to the association as a gift and in 1955 when they had their renew first election for the chairman and executive members. After the Second World War, Mr. Chan Kwong Charn was elected as the first chairman of the resurrected See Yep Association. The term for chairman was agreed at four year interval. Mr. Chan was re-elected for the second and third term. During the third term he died due to an illness. Vice chairman, Mr. Wong Man Chung was elected to succeed him. Mr. Ng Cheuk Lok was elected as the fourth term chairman. Mr. Pang Hong was elected as the fifth term chairman. After the war, because of successive terms of great leadership, the work of the association had been running smoothly and successfully. This led to the members had an organisation to rely on during their difficulties. The sixth term chairman was the well-loved and respected Mr. Yee Wah Dun. He realised the duty he was entrusted with was very important, he made great effort to improve the association's prosperity. He was humble and generous and because of his great virtues it was considered that he had improved and created a bright future for the association. From 1989-1996 the seventh term chairman was Mr. Shu Hing Cheng. During the last few years of his rein he thoroughly modernised the community centre. In 1996, at the age of 48, Mr Kenny Kwong Tam was elected as the 8th term Chairman. He was the youngest chairman since the association began. He is still running the association today. His dedication and effort are devoted to modernise the association. Regular meetings are held for discussion, organising entertainment, day trips, annual cemetery visits, group holidays and other social events. With the generous donation from our members and friends, we were able to puchase the land of 22 Nelson Street, where our association is situated. Mr. Kenny Kwong Tam has the vision to create a strong and closely-knitted community, and he encourages the young members to participate in our association's activities, so that See Yep Association will go on for many generations to come.